.•	Masterfully designed by local architect, Peter Bevan. The 1970s townhouse offers iconic retro architecture and furniture. Quality linen, Heat pump, Sky TV and wireless internet, selection of DVDs and books. 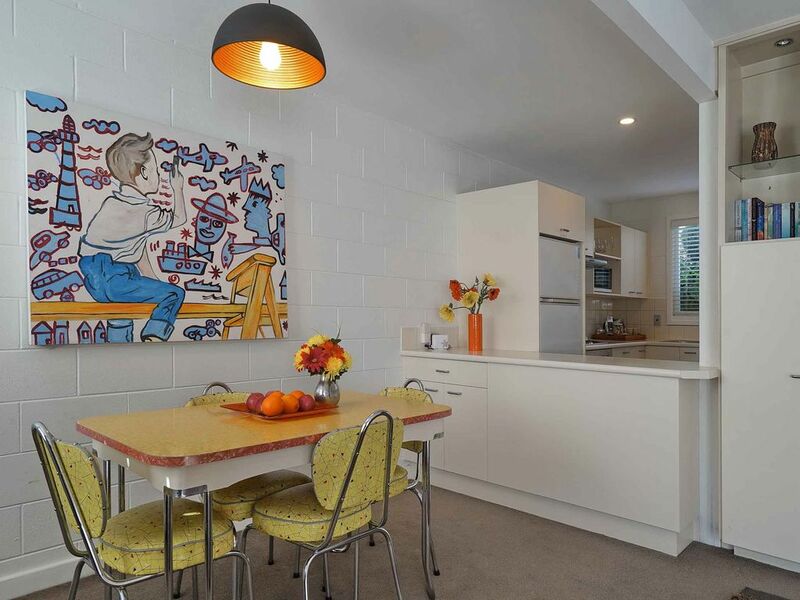 •	Located in a prime position on a quiet street close to award winning Botanic Gardens, Hagley Park and Avon River, cafes, restaurants and high street shopping. Only ten minutes’ walk in either direction to Merivale Mall, Carlton Mill, Victoria Street, Central city and re start Mall. •	The townhouse has high pitched ceilings which offer an impeccable sense of proportion. The lounge, kitchen, laundry and toilet are on the ground level with French doors open directly to the North facing secure courtyard. Upstairs offers two bedrooms and bathroom. Green foliage surrounds the property. You can see the trees of Hagley Park from the bathroom. Quality linen, electric blankets and duvets are on all beds. Bathroom has a shower over bath. Toilets are on both levels. Kitchen is well appointed with everything you require. The pantry contains basic food items for use during your stay. There is also a separate laundry with washing machine and dryer. I was born in 1959, and have lived in Christchurch all my life. Thankfully I have traveled a lot both privately and with work. I now spend my time selling real estate and managing rental properties. I really enjoy biking, walking and skiing. My attraction to this property was the location. Its very close to Hagley Park, the Avon river, Merivale Village and the Central City. The building is in a cluster of iconic 1970s townhouses built by Peter Bevan. I really like 70s architecture and being able to stage the property with furniture that creates a sense of fun. Merivale Village, 189 Papanui Road, Christchurch a cool hub of shops, cafes and restaurants. Great location near the wonderful Hagley Park. Very comfortable accommodation. V interesting art. Very comfortable accommodation, beds excellent. Kitchen stocked with all the required basics. Private and peaceful area ... great for sleeping. Taller people should be aware of the low overhang halfway down the stairs. Loved our stay! The apartment was super clean, trendy and great for our dog too. Owner very responsive, would love to stay there again. A really attractive property and super handy to everywhere we wanted to go. Very nice courtyard also containing handy plants for making meals more interesting! Hagley Park very close so super for walking our dog - she loved it too. Thanks Liz. I also love walking into town, along the river into the city. Its relaxing. All part of the holiday feel. Super convenient location: easy to walk to restaurants, grocery store, bank on Papanui Road, also easy to walk to Hagley Park and CBD. It's close to busy streets, but was quieter than I expected. The house was clean, comfortable and had everything we needed. Limited parking in the neighborhood. Clean, spacious lovely townhouse and great location, lovely garden and quiet street. Great location, perfect for what we needed. Merivale is a suburb of Christchurch, New Zealand, north of the city centre. It has charm and graciousness with its narrow streets and lanes and many original cottages, which are rapidly being restored. The Mall with supermarket, boutiques and upmarket shops are in close proximity to the central city.